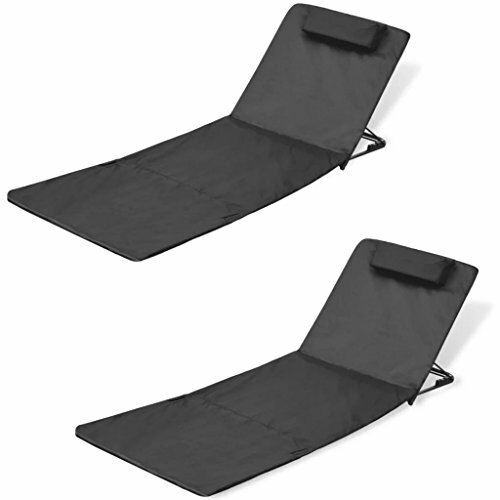 This beach lounger set, consisting of 2 folding beach mats with backrests, is a great choice to take along to the beach, campsite, deck, etc. With a storage pocket; ideal for magazines, etc. This folding beach chair set, consisting of 2 folding beach mats with backrests, is ideal to take along to the beach, campsite, deck, etc. Each sun lounger consists of a high-quality steel frame and a fabric mat. The sun bed has a storage pocket, which is ideal for keeping magazines and other items. The adjustable backrest of the relax chair has a built-in pillow that will even cater for your afternoon siestas. This sun chair can be folded down neatly for easy portability and storage. Delivery includes 2 folding beach mats. We are shipping from the United States, shipping time uauslly cost 3-7 business days.